Put on a smock, pick from one of THOUSANDS of figurines, grab your paint brushes and have some fun! Plaster Fun Time is Boston-area original location for Family fun, birthday parties and group outings for craft-loving kids of all ages. Designed for artists 2-102 years of age, walk-in’s NEVER need a reservation! Come when you want and stay as long as you want. Plaster Fun Time’s pieces, supplies and finishes ensure that everyone’s creative experience is FUN and every take-home work of art is a MASTERPIECE. Even better, with the largest selection of plaster figurines to paint ***in the world!! *** (really, we’ve looked! ), there is always something new to create. Unlike ceramics, there is no waiting or return trips to pick up your finished project and your creation won’t get broken when it is heated (or ‘fired’): At Plaster Fun Time, your project is always ready to go home when you are. With 9 Boston-area locations that are open 7 Days a week (M-F 10 am – 6 pm, Saturday 10 am – 7 pm, Sunday 11 am – 6 pm), we are always just a short drive away for creative fun for the entire Family. 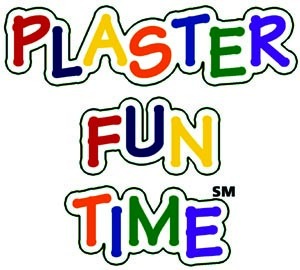 For more information, visit our website (http://Plasterfuntime.com), find your local store on Instagram or Facebook, and be sure to sign up for our VIP Club, where you get exclusive coupons and news on special events. Be sure to sign up for their online club, they send you discount coupons for holidays. Recommended for ages 2-102. We have items for customers of all ages! Our all-inclusive prices start at $11.99. You pick your piece from our selection of THOUSANDS of items and everything else you need is included (unlimited paints, multiple artist-grade brushes, and all of your supplies). My three kids like this place a lot. Been going to the one in Newton and now there is one on River Street in Waltham. The place is always staffed by great people who learn the kids' names and really encourage them to paint it their way as the slogan goes. You can't make a reservation for a table on busy days but parties can be reserved. I have had two kid's parties there and they both were run great. Even on weekends the place is busy but fun for the kids. We now have dozens of plasters around the house but the kids won't let me toss any of them away. Great gifts for grandparents if you know what I mean. I had heard that this place was a good idea for my kids from other moms and seen the commercials on TV. I was also crazy enough to visit on a busy Sunday afternoon. I'll just say that this place is busy for a reason. The staff showed my boys the selection, they got them started, and we sat and painted for more than an hour. I have never gotten them to sit down that long in my life. Prices are very good. $8.99 buys a good sized piece with all the paint and finishes (sparkles etc.). Of course my boys loved the fact that they got to take home the pieces that day. They even made friends with the other kids at the table. This will be one of my 'go to' places for vacation week coming up and no doubt play dates. I found Plaster Fun TIme on BostonCentral so I thought that I would offer a review. The party was a big hit for a big party fo 20 six year old boys. Well managed and easy for me. I brought the cake and drinks and they basically kept the kids busy for an hour and a half. Kate in Framingham really kept the kids laughing and the pieces that the boys made looked pretty good. I also lile the $10/kid price for my big group. Small prce to come home to a clean house. We just went to a Birthday Party at Plaster Fun Time in Charlestown. I was worried about parking, but there was a big lot with Johnny's Foodmaster. The party was the most fun my son has had. Now he wants to have his 5th birthday there. We brought our son to a plaster fun time party. He had a great time and came home with a cool red sox plaque. He has not stopped taking about it all week, so I'm bringing him back today. Very disappointed in the birthday parites run by the Framingham store. I had previously been to two other parties and the staff was very engaged, pretty much taking care of everything. For my party this past weekend, the staff was very disengaged and not at all helpful. Their only help was giving us the material, with the parents having to direct and help the kids. Very disappointing!!!! Plaster Fun Time is a great place that I take my kids whenever we need to get out of the house. It is great for the kids because of all of the shapes that they let you paint and the fact that you get to take if home the same day. I signed up for the online club and have been getting coupons fairly regularly. You can sign up if you just go to their website. Another good thing that they do is run fund raisers for my kid's school. We have early release day on Thursdays in Waltham and they gave 20% back to the school. I am a Big Brother and have been for 3 years. It is always tough to find a good place to go to have fun and have us both enjoy. My little brother is a cool kid. He likes anything gorey. Other big brothers told me about PFT. I am telling you that this place is cool. You get to pick a statue and paint it. Pretty basic but the place totally focuses on kids. My little brother saw the dozens of skulls and lost his mind. I enjoyed painting a pencil holder shaped like a golf bag. The key thing is the atmosphere is cool and the people who work there make it easy. They say it is for kids but I give it the thumbs up for anywon looking to relax and just paint. Rain+school vacation=Plaster Fun Time. We go here all year round but love it on school vacation days. The idea is pretty simple; you bring the kids in and they pick out a plaster shape to paint. My kids know their way around but the staff is there to help you get started. The place is always busy but the kids don't mind. The cost is about 7 or 8 dollars and you take it home that day. My 2 year old is too young but my 9 year old twins and 6 year old boy would go every day if they could. I had my neice and nephew in for the weekend and this place saved me. We walked in and the staff took over. We needed to make something for Father's Day. We painted a 'Super Dad' plaque and a computer pencil holder. The staff was great and I really had fun. I was amazed that the materials dry so fast that we took everything home the same day. Greaat place that is a perfect no brainer for those of us who just get the kids for a day. I love to go here and paint like a artist. I really liked going to Plaster Fun Time in Salem because it was a lot of fun. I like all the different statues you get to choose from. I picked the Sponge Bob Square Pants one to paint! I think it's good that they let the kids pick out all of the colors that they want to use. My favorite part was getting to choose sparkle and shine spray to put on my Sponge Bob! The man that worked there was also very nice! I would love to go back to Plaster Fun Time!